This year’s camp marked the 35th Annual Tukido Summer Camp, a Tukido rite of passage for students, putting them through their paces with training sessions the morning and evening for consecutive days, whether rain or shine, and with the end goal for many to pass their grading. Camp is also always provides a great opportunity to get to know other students and members of other clubs. Additionally, Tukido camp would not be complete without some camp cuisine as cooked outdoors by the students, camp competitions, and a roaring bonfire to crowd around. Luckily for students from their arrival to leaving the camp this year the sun was beaming down on them and there was an uncharacteristic lack of waterproof clothing on show. This facilitated glorious conditions for training and sporting activities between such as rounders, frisbee and hiking up Tinto hill. 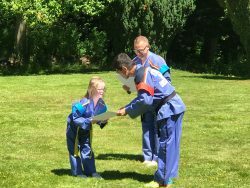 This camp also celebrated some excellent achievements in the form of two black belt promotions – Andy Gibson (promoted to 1st Dan) and Kim Walker (promoted to 2nd Dan). Well done to both Andy and Kim on all their hard work! Where do I begin with what to say about my time at Tukido Camp, I’ve trained with Irvine Tukido club since October 2017 and after a long time of my sister convincing me to join I can only wish I had started sooner as my time here has been inspirational. I can begin with saying that Tukido is one massive happy family. 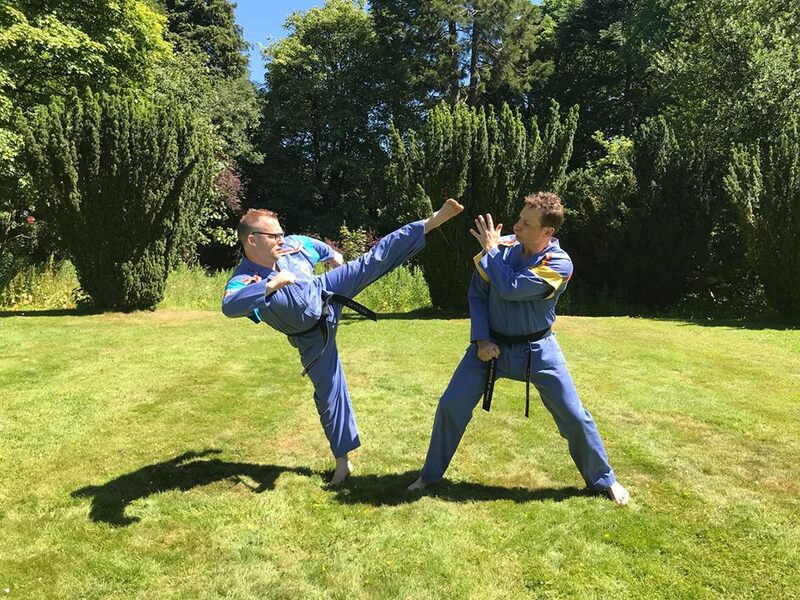 Since I started I was welcomed with open arms and encouraged since the day I walked through the door by everyone, my instructor Master Charles Tonner has been exceptional at pushing me in the right direction. When I was younger football was my main focus, however, this has been by far the best team I’ve ever been involved in. At Tukido Camp I realised this extended not only to my home club in Irvine, as I got to meet other clubs and members and those people were just as great. 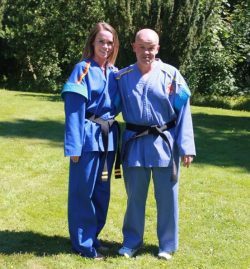 As well as training under Grandmaster Teh himself , both my mentors there Kristina and Alan were excellent at training and preparing me for my grading with only four days to do so. Even given I had just sat a grading few weeks earlier so the challenge was on for them, however they never gave up on me, and pushed me towards that grading which I passed. I couldn’t be happier for what Tukido has done for me with the inspiration, the confidence it has gave me and quite simply making me a much better person. When I first arrived at camp, I shared a lovely cabin with my mum and friend Caroline. My 3 favourite things about this camp was training twice a day, playing games with all my Tukido friends e.g. Frisbee, rounders and catch the ball and lastly going out for dinner every night. I enjoyed taking part in the competitions and grading and also sitting around chatting at the campfire each evening. I hope to return again and have as much fun as I had this year. To see more photos from this year’s camp – click here.